Highlands Stud part of Ridgemont’s outstanding resident sire Dynasty was represented by his 10th South African graded winner this season when his son African Night Sky outclassed a smart field to win the G3 Cup Trial at Greyville on Saturday. Bred by Highlands, and an impressive winner of last season’s Winter Series, the four-year-old African Night Sky put up a performance which had to be seen to believed in Saturday’s 1800m feature. Last at one stage, African Night Sky, ridden by Grant Van Niekerk, sliced through his field like a knife through butter to win the 2018 Cup Trial by three parts of a length over multiple G3 winner Crowd Pleaser. It was a fourth graded win for African Night Sky, with the latter having previously won all of the G3 Winter Guineas, G3 Winter Classic and G3 Winter Derby. 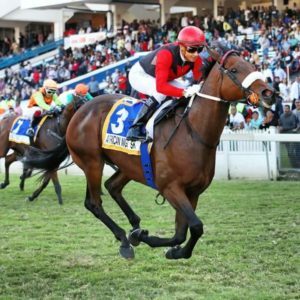 Trained by Justin Snaith (who last won the Vodacom Durban July with Dynasty’s son Legislate), current Vodacom Durban July favourite African Night Sky has now won six of 13 outings and has earned R848 400. 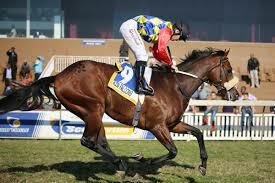 Bred on the same Dynasty/Cozzene cross as triple G1 winning sire Jackson (sire of Saturday’s Cape Nursery third Mr Crumford), African Night Sky, whose dam is the stakes winning Cozzene mare Starzene, was an R850 000 buy from the 2015 Cape Premier Yearling Sale. His four times Equus Outstanding Stallion Dynasty has had another remarkable season in 2017-2018 with his top performers including G1 Investec Cape Derby winner Eyes Wide Open and G1 Summer Cup hero Liege.